At the top of the ATV pyramid are the quads designed with championships in mind. These are the racers, capable of maximum performance, and while this segment of the market receives most of the attention, it becomes easy to overlook the huge number of less experienced riders who simply love to ride the trails. For those riders, a sporty ATV with good power, handling, reliability, and affordability work far better than one with a finicky race engine. Luckily, there are quite a few mid sized sport ATVs under 350ccs that work perfectly. CAN-AM has a knack for making every model in the lineup look sporty, and our first impression of the DS 250 is that it looks GREAT! Styling is racy, strong, and evokes the image that CAN-AM is known for, and there is no doubt that this model is aimed straight at the sport segment. This is no purpose confused quad! There is much more to the DS 250 than the looks, however. Chassis design on the DS 250 is quite robust for an entry-level model, and one feature we definitely like on the DS 250 is a traditional foot peg. A sturdy and comfortable steel foot peg allows a rider to pivot their feet much better than a floorboard style footrest, and the DS 250 peg is excellent. The plastic injection molded bodywork on the DS 250 fits together very well, doesn’t flop around, and is flexible enough that it can take quite a bit of bending without showing a crease, or worse, cracking apart. Suspension on the DS 250 is typical for an entry-level sport bike, and features dual A-arms at the front end, a steel swingarm at the rear, and entry-level style shocks with pre-load adjustment. Braking is through dual disc brakes at both ends, with steel braided brake lines for added stopping power. We were also happy to find both front and rear brakes are independent of each other. The heart of the DS 250 power-train is a liquid cooled, 250cc 4-stroke engine driving a CVT transmission, and final drive is through a typical sport bike chain drive system, with one added twist. The chain is on the right-hand side of the motor! Chain adjustment is as easy as they come on the DS 250. Simply loosen two bolts, rotate the eccentric axle carrier to the correct adjustment, tighten bolts, and get back to riding. When we hopped on the DS250, everything felt completely natural. The seat is comfortable, the pegs are well located, and controls are easy to reach. Once underway the motor runs clean and crisp and will provide snap when asked. We pushed the DS 250 at every chance, and although you can feel a little extra weight, it performed quite well. The DS is a capable jumper, and it does nothing strange in the air, but since it has intro level shocks, it can also be a little harsh in choppy sections. Cornering is usually quite predictable, and sliding the DS 250 is very possible, but so is 2 wheeling due to a narrower wheelbase. 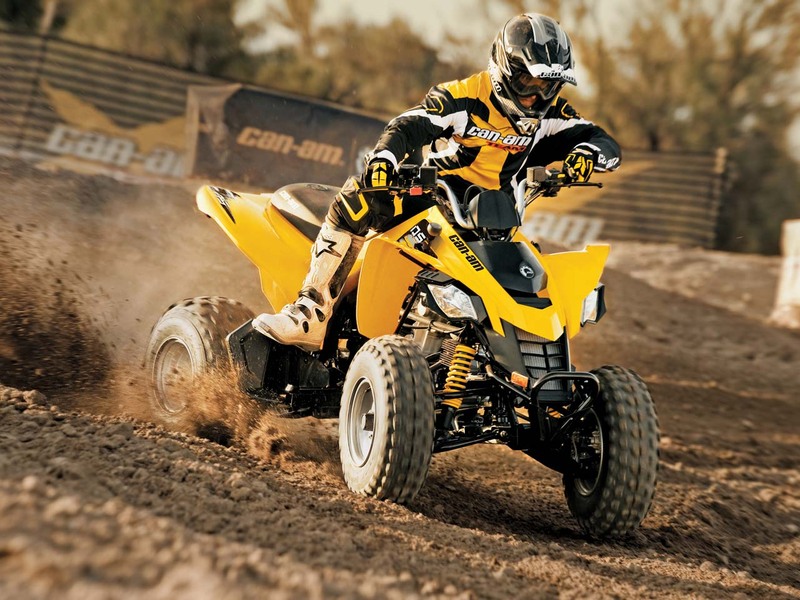 We really like the CAN-AM DS 250! Although designed for a less experienced rider, we had a blast hitting berms, popping the front end over obstacles, and generally play riding. Sometimes it takes a model like this to remind us why we started riding in the first place. It definitely has sporty looks, it’s easy to ride, easy to control, and yet the motor can provide a little snap. It’s ATV fun in its basic form! If Shakespeare had been a new ATV rider, his famous line might have been, “To shift, or not to shift.” That is the primary question for new riders, who often feel intimidated by learning to work a clutch and gear shifter while tacking the other fundamentals of riding such as proper body position, crossing off cambers, etc. While other manufacturers have taken either the simplistic approach by offering a CVT transmission, or, the go-for-broke, sink or swim method of a full manual gearbox and clutch, Honda’s TRX 250X offers a middle ground. The TRX 250X offers Honda’s SportClutch which is a little engineering marvel that allows the ATV to be operated either as an auto clutch, all but preventing new riders from stalling, or as a manual clutch when they’re ready for more aggressive riding. A sealed shaft drive makes for efficient power transfer to the rear wheels and simplifies maintenance, which is another important factor for new riders. The 250X features Honda’s air-cooled, 229cc 4 stroke engine mounted longitudinally in the chassis. The advantage is the engine output shaft aligns perfectly with the rear drive shaft. A two-valve cylinder-head design features performance-optimized valve timing, a 31.5mm-diameter intake valve, and a 27mm-diameter exhaust valve to produce a broad, usable power band that new riders will find torquey enough for fun, but very controllable. No need to scare them on their first day! Excellent ergonomics, agile handling, and legendary reliability are all traits on which Honda has built a stellar reputation, and the TRX 250X fits in nicely with the rest of the family. It’s an agile, sporty, slightly smaller sized ATV that makes learning a breeze, and new riders will love it. No other company enjoys the loyal following Honda has earned, and it all comes down to a couple key things: attention to detail, and reliability. Regardless of the model, we’re sure it was well built, and we’re also sure we won’t end up walking back to the truck. The Honda sport ATV lineup is built on the same principals. Honda’s TRX 300X is their mid sized sport ATV designed to bridge the gap between strictly entry level machines and high performance models. At the heart of the 300X is a 282cc, air cooled SOHC 4 stroke engine with electric start and a gear driven counterbalancer. It provides enough power to make things exciting, but it’s completely predictable and won’t overpower less experienced riders. The five speed gearbox shifts perfectly every time, and a chain drive transfers power to the rear wheels. The chassis of the 300X is a box section steel frame with double-wishbone independent front suspension and single-shock rear suspension. Both front and rear shocks offer preload adjustability. Disc brakes are found at each end, and aluminum wheels complete the package, although we would prefer a more sporty rear tire with a flatter profile for easier slides. Ergonomics on the 300X are typical Honda – everything is in the right place and comfortable. As with most Honda’s, maintenance is a breeze. Chain adjustment is super easy thanks to the eccentric adjuster, the air filter is located right under the seat, and the oil filter is easily found on the right side of the engine. If you can’t maintain a Honda, you should probably check yourself into a self help program. We have no doubt the TRX300X will run for years on end with nothing more than a little regular care. Expect several generations to love it! It seems a little odd that a company so bent on performance in every other product line relies on the 300DVX as its top sport ATV. There would seem to be plenty of loyal ‘CAT sled riders eager for a high performance sport ATV when the snow disappears, but perhaps they migrate towards one of the Sport/Utility ATVs in the CAT family like the 700, or even the ThunderCat 1000. The 300 DVX has been alone in the role as Arctic Cat’s full sized sport ATV for the past several years, and although definitely not in the class as a 450cc racer, it does allow new riders a chance to enter the sport on a machine that won’t intimidate them. The DVX engine is an electric start, 270cc, liquid cooled 4 stroke driving a CVT transmission. The transmission does feature reverse, and all a rider needs to do is select a gear, stab at the throttle, and they are off. The chain drive insures efficient power delivery, and a super simple eccentric chain adjuster makes maintenance easy. The battery is located under the seat, along with the air filter. The DVX also features dual A-arms up front, a steel swingarm at the rear, and hydraulic disc brakes at both ends. The overall size of the DVX is ever so slightly smaller than most full sized quads, but it is comfortable. Unique features only found on the Arctic Cat are the “mix and match” fenders which can be taken apart to fit the rider’s whims. The DVX is comfortable to sit on, although the tank is not as narrow as some sport ATVs, but controls are well placed and easy to reach. On the trail the 300 DVX has decent but not overwhelming power, and gets up to speed quickly. Through the whoops, the DVX tracked well, but with its rather narrow stance, it is possible to two-wheel. For newer riders though, the 300DVX can provide plenty of trail or dune excitement. Few machines have introduced more riders to sport riding than the Polaris Trail Blazer. For 2010 the Trail Blazer 330 received upgrades giving it a racy, new look and OUTLAW inspired styling, and comfortable, redesigned ergonomics. Underneath the new skin are thicker disc brakes, a new master cylinder, a more powerful lighting coil, and a new fuel gauge. Standard is a high beam and gear light indicator, high temperature warning light, and a DC outlet for plugging in accessories. Suspension was also updated at both ends to provide 8.2 inches of travel up front and 10.5 inches of travel at the rear. Through the years, the Trail Blazer engine has evolved, and today it is a 329cc air cooled, four-stroke single cylinder engine with fan assist. Electric start with recoil backup is standard, and the fully automatic CVT transmission has Forward/Neutral/ and Reverse gears. An oil cooler helps keep the motor operating at consistent temperatures, which definitely contributes to its excellent reliability record. When it comes time to bring everything to a quick stop, a handlebar mounted, single-lever braking system powering dual hydraulic front discs and a single rear disc is used. For rear braking only, there is a foot brake on the floorboard. One thing that has never changed with the Trail Blazer, its rack equipped twin brother the Trail Boss 330, or any member of the Scrambler family for that matter, is reliability. These things run FOREVER! We’ve got friends who have used and abused their Blazer through mud, snow, dust and sand, year in and year out, and it never gives up. The new Trail Blazer 330 delivers a ride that is spunky but not overpowering, easy to control and operate, and meant for decades of trail riding fun. Expect it! Despite being designed for new and less aggressive riders, the Phoenix 200 chassis is one of the most robust sport ATV frames we've ever seen. Dual A-arms up front offer 7 inches of travel, and the rear gets 6.5 inches, with all three shocks offering five preset adjustment positions. Rear brakes are a sealed drum, while hydraulic disc brakes are found at the front. The Phoenix engine is an electric start, 196cc, air-cooled four-stroke, mated via sealed aluminum cases to a CVT transmission. The motor is very similar to the type found on many import ATVs, but instead of a chain, a sealed shaft drive system pushes the Phoenix along. On the side of the motor, you'll find two sight glasses allowing for a quick oil check. Why two sight glasses? Because the engine has two separate oil reservoirs, insuring gear case oil doesn't contaminate crankcase oil. Nothing gets in the way or seems out of place when climbing aboard the Phoenix. A rider is quickly at ease with the controls, and the relationship between the seat, controls, and pegs all seem very good, especially for a slightly smaller rider, although we wish the handle bar bend was a little less aggressive. Once underway the motor does have a little zip, but it’s still only a 200cc four-stroke with a CVT transmission and shaft drive, so don’t expect to outrun other sport ATVs. The Phoenix 200 is sporty, fun and super predictable. You’re not going to pull wheelies or soar over big jumps, but it was designed to learn on, not race on. In fact, smaller riders, new riders or people who want to try ATVing for the first time will definitely find a home with the Phoenix. We’ve called the Yamaha Raptor 250 the best ATV there has ever been for aspiring sport riders, and it’s a claim we’ll stand behind anytime. There may be ATVs in the class that are a little easier to learn on, thanks to a CVT transmission, but none come close to the Raptor 250 in fun. The Raptor 250 is graced with the racy lines, a pure sport chassis, and suspension derived from its big brothers the YFZ 450 and Raptor 700. A quick revving, potent, 249cc two-valve, four-stroke engine with electric start mated to a five speed gearbox, and chain drive gets the rear wheels spinning. The most important factor on any sport quad is handling, however, and in this area the Raptor 250 really excels. It’s at least 50 pounds lighter than any other model in the class, and that makes a huge difference in handling. Although the Raptor 250 sports a compact chassis and a short wheel base, in the air it doesn’t do anything crazy, and is extremely confidence inspiring for new riders. At the rear, a simple direct link shock helps the Raptor skip through the rough stuff, and at the front, a tradition dual A-arm setup is found. Ergonomics of the Raptor 250 are as well designed as every other part of this ATV and the narrow tank area makes it extremely comfortable to sit on and move your body around. It’s impossible to take the Raptor 250 out and not return with a smile. It’s a blast to play on, it’s reliable, predictable, and rugged, and nothing can touch it. The Raptor 350 can trace its heritage directly from one of the best selling sport ATVs of all time, the Warrior 350. A new name, new bodywork, and other updates bring the Raptor 350 inline with other members of the Raptor family, but it retains the rugged and reliable 348cc, air-cooled, SOHC, four-stroke engine. Electric start brings the engine to life, and a six speed transmission and chain drive get you rolling. The Raptor 350 chassis features dual a-arms up front, with preload adjustable shocks offering 7.9 inches of travel. A steel swingarm in the rear and linkage type suspension is controlled by a piggyback reservoir shock with adjustable preload and 8.3 inches of wheel travel. The Raptor 350 also features large diameter vented rotors, and disc brakes at all corners. Low profile tires mounted on aluminum wheels help provide sporty handling, and sturdy pegs keep your feet securely planted. The overall weight of the Raptor 350 is 396 pounds. One feature we especially like is grease fittings at all suspension points which make maintenance much easier. With its sporty look and enviable record of reliability, we expect to see a long line of Raptor 350s on the trail for many years to come. Suzuki needed to bridge the distance between their incredibly popular Z90, and the potent Z400. The answer was the QuadSport Z250. The QuadSport Z250 features aggressive-styled bodywork, high-clearance fenders, performance-inspired graphics, and a vertically mounted halogen headlight, but nothing speaks more to it’s sporty heart than Suzuki’s trademark T-bone seat. Long ago Suzuki realized the T-shaped seat is both comfortable and highly functional on a sport ATV, and the QuadSport Z250 wears the badge proudly. The chassis of the QuadSport Z250 is a rugged, steel-tube frame with a steel swingarm-type rear suspension featuring a single shock absorber, with five preload adjustments and 6.7 inches of rear wheel travel. At the front, dual A-arms with preload-adjustable oil-damped shock absorbers provide 6.3 inches of wheel travel. One feature we really like is the serrated-type foot pegs which are much better for a sport machine than any floorboard, allowing the rider to shift body position as needed. In a highly unusual twist for any sport machine, Suzuki also includes a very handy, 5-liter, water-resistant storage box under the seat! Great idea! Braking on the Z250 is through twin disc brakes up front, and a single drum brake at the rear. The engine on the Z250 is single cylinder, 246cc, SOHC, air-cooled, 4-stroke designed to produce smooth, usable power over a wide rpm range. Electric start is standard, and a Mikuni 29mm carb mated to a large capacity airbox and a specially tuned exhaust give the Z250 a throaty sound, again reflecting its sporty image. A five-speed transmission with reverse gets you rolling, but to make learning a little easier for new riders, an automatic clutch and sealed shaft drive system are found on the Z250 as well. We like the QuadSport Z250! It looks sporty with either the bright yellow or white bodywork, the T-bone seat is comfortable, and the storage under the seat is a great idea! It bridges the gap nicely between all-out sport machines and bare-bones intro models, and the QuadSport Z250 will provide plenty of trail riding thrills for many! The Mongoose 300 has been Kymco’s flagship sport model for the past several years, and we’ve tested it in about every situation. We’ve even raced it! Overall size is about the same as any other full sized quad, and just like other sport ATVs, the Mongoose features dual A-arms up front, a steel swingarm at the rear, and hydraulic disc brakes at both ends. In fact, the rear 4-piston caliper could probably stop a car. The Mongoose 300 engine is a liquid cooled, 4 stroke mated to a CVT transmission, and typical to many Asian manufacturers, its origins were from a scooter. The transmission does feature reverse, and the rider only needs to select either forward or reverse, and the CVT will take care of everything else. Since the transmission countershaft is on the right side of the motor, the rear sprocket and disc brake are reversed. Thankfully, the Mongoose features an easy to use eccentric chain adjuster. As with most quads, the Mongoose 300 is electric start, and the battery is located under the seat, along with the air filter. We also like the easy to read windows on the engine for fluid checks. Another feature we like on the Mongoose swing arm is the composite skid plate which does a good job of protecting the brake rotor and sprocket. The polished aluminum DID wheels are top of the line, and the Kenda tires are excellent. On the trail, the Mongoose is comfortable! Though not as narrow through the tank as some sport quads, overall it fits well and the plastic bodywork is excellent. We wish the foot baskets were deeper for our size 12 boot, but the bars and controls were well placed, the thumb throttle angle is good, and the other controls were all easy to access. About the only thing we had to figure out were the symbols on the switches, which are a little different than on most other ATVs. We had a great time blasting around on the Mongoose 300. It has decent power, gets up to speed quickly, and when it came time to get some air, the Mongoose flies well. In the rough sections, it would track straight even when pounding the whoops, although the shocks seem unbalanced with the front MUCH too stiff. Overall though, we’ve thrashed it on the trails and the track, and it has never let us down.